The deal also marks a significant milestone in the separation of the Dutch insurers bank and insurance units. ING Groep NV, the biggest Dutch financial-services company, will post a €1.2 billion ($1.6 billion) charge after agreeing to end some payment obligations to its pension fund in the Netherlands. ING will terminate future funding and indexing obligations to a pension plan that guaranteed payouts for participants, the Amsterdam-based company said in a statement today. The first- quarter charge includes a €400 million payment to the fund, while €800 million is related to the removal of the pension assets on ING’s balance sheet, it said. The agreement will reduce swings in equity in ING’s banking and insurance units resulting from changes in pension accounting rules. The deal also marks a “significant milestone in the separation of bank and insurance” as ING prepares to sell shares of the insurance unit in an initial public offering this year, Chief Executive Officer Ralph Hamers said. ING shares fell as much as 1.6 percent in Amsterdam trading today, and had swung to a 0.7 percent gain, to €10.59 at 12:50 p.m. local time, giving the company a market value of €41 billion euros. The stock advanced 43 percent in 2013. The company reached the agreement with the retirement fund, trade unions, the workers council and retirees. ING said it expects to announce a final settlement, following regulatory approvals, in March. The pension fund manages about €18 billion euros in assets for 70,000 current and former employees of ING’s Dutch banking and insurance units, it said. ING announced in 2012 it would switch to a new pension plan, with defined contributions rather than guaranteed benefits in 2014. In the set up, it will create separate funds for its Dutch banking and insurance employees before its final break up. Under revised rules, companies have to account for actuarial investment gains and losses on defined benefit pension plans through equity, resulting in volatility due to market movements. As a result of the deal announced today, the Dutch defined benefit plan will be removed from the company’s balance sheet, and the fund will become financially independent. Contrary to most Dutch pension funds, ING had to provide its pension plan with funding needed for higher retirement payouts, an obligation that has led to disputes as the company refused to pay, citing a need to preserve capital. As part of the agreement with the fund, ING will make a final payment for a 2014 increase, ING Pension Fund said today. After that, it will become responsible itself. “In the end, the joint interest in providing a sound pension for former and current employees and retirees has led to this result,” the fund said in a statement on its website. 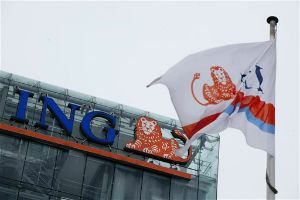 ING Bank’s core Tier 1 ratio, a measure of its financial strength, will be cut by about 100 basis points, the company said. Under future regulatory capital rules, that impact is limited to about 20 basis points as the pension asset is already deducted from capital. The insurance unit’s solvency ratio will decrease by about 3 percentage points, ING said. “As a result of this pension charge and the switch to defined contribution, the risk profile of ING Group declines because there will be no indexation charges anymore in the future,” Cor Kluis, an analyst at Rabobank International in the Dutch city of Utrecht, said in a note today. It also further cuts ties between bank and insurance, said Kluis, who recommends investors buy the stock. ING is preparing to sell shares in the business, which also includes Japanese insurance assets, by the middle of this year, Chief Financial Officer Patrick Flynn said in May. The firm has reached the “end phase” of a restructuring program imposed by European regulators after two rounds of state aid in 2008 and 2009, it said in November.